A well illuminated, two rooms apt. air-conditioned, with all facilities for a comfy stay. Large living room with 2 sofas (one converts into a double bed 1.4x2.00m, for 2 extra guests or 2 children). Large bedroom - 1.6x2.00m. Big bathroom. Working space. Brand new facilities: Smart 4K LG TV (43"), Fast Internet , WiFi. Kichenette with mini fridge, Microwave, Nspresso machine. Kettle, toaster. Toiletry facilities, hair dryer etc Outdoor sitting corner with umbrella. A beautiful garden apartment one out of three of Avgi's Home. Apt has a nice external garden sitting area and many facilities for comfy charming stay. Breakfast is served to the apt or may be taken at a separate kitchen (to be used by us, the owners only). This old house was recently renovated to the finest details keeping the old classic characteristics, yet providing the latest technology equipment and facilities. Located in the Heart of the Old Town of Limassol and close to almost all Point Of Interest : Marina, Richard Lion Heart Mediaval Castle and Square with tavernas, restaurants, cafes, beer brewery and others. Swimming beaches, entertainment areas and shopping. All within a distance of a few minutes, pleasant walk. Breakfast is CONTINENTAL and is served every day - No extra charge. On Sundays BREAKFAST is prepared on Saturday. I am Miretta, Avgi's daughter. I continue the family's tradition - Hosting people with love. I speak several languages: Greek, English, Italian and I can communicate in German and Hebrew. I am a very well known sociable and open hearted Limassolian personality (Limassolians are very well known for their hospitality and friendly approach). I read lots of Romantic, Middle East and European history. I adore cooking. I travel a lot to Italy and classical Europe. I love music, especially Greek. Our guests will get a warm welcome and help in whatever they need for information, traveling, entertainment, dining, shopping etc. Guests will be helped, advised and guided by my husband and myself, as much as we can. Welcome to my home, "Avgi's Home". It is an Amazing, beautifully renovated NeoClassic Home at the Central Heart of Old Limassol. Adjacent to any and almost every Point Of Interest of Limassol. This property is a unique House where my Grand ParentS lived, my parents and this is the place where we grew up and spent most of our life... This is where my mother hosted hundreds and thousands of people. This is the scent of my childhood and my adult life. Our bathroom contains everything needed for nice, hygienic refreshening, showering and all other toiletries. We supply shampoo, washing up liquid, towels, cleaning materials and all others necessary for complete hygiene. Dining in room or Central kitchen/dining room or garden Breakfast is CONTINENTAL and is served every day - No extra charge. On Sundays and Holidays BREAKFAST is prepared the night before. Unfortunately and due to home structure, home in not suitable for wheel-chair. First Aid Kit, Sewing Kit, Smoke/CO Alarm, Safe Box, USB Charger, Night Lamp...etc etc Breakfast is CONTINENTAL and is served every day - No extra charge. On Sundays and Holidays BREAKFAST is prepared the night before. My stay at 'Olive Garden Apartment' was exceptional in every way, from the very warm welcome to the well appointed accommodation that was tasteful and stylish. Attention to detail, including the delicious breakfast and the spotless presentation made for a wonderful few days. Dear Juliana. You came as guests from the other side of the world but very soon we felt like family. You, your daughter Nina, your brother in law, you all gave us a wonderful feeling and it’s a pleasure hosting people like you. You left the place clean, neat and very well arranged and organized. We invite you to visit us again and again, with love. Kiss Nina for us and we hope to see you soon. 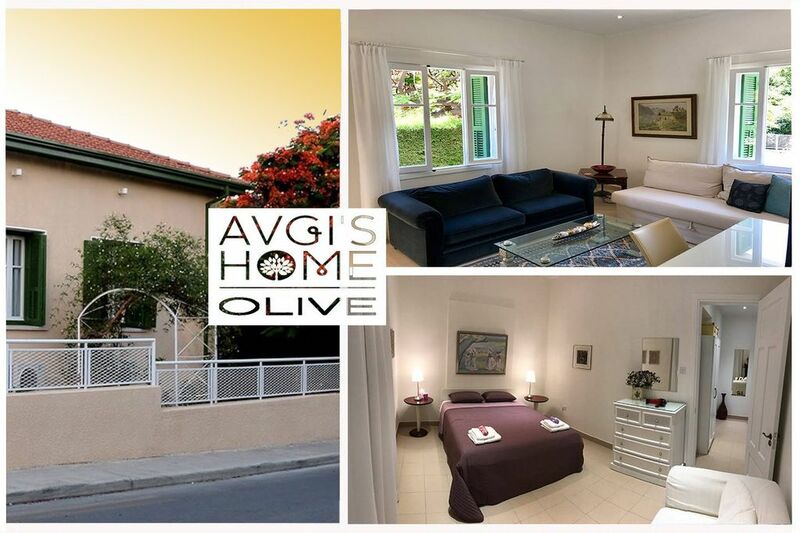 Avgi's Home is an old classic house, fully renovated. .Located in the heart of the Old Town, adjacent to the Old Water Tower and privileged with the vicinity of almost all points of attraction of Limassol: Marina and beaches (7-10 minutes pleasant walk). Old classical Irini Str. with Restaurants (just behind). Saripolou Str. and Heroes Square area (night life, theatre, restaurants, tavernas, bars etc). Anexartisias famous shopping Str. (just a short, pleasant walk). TEPAC University. Richard Lion Heart Medieval Castle and Square surrounded by local picturesque restaurants and tavernas, for all tastes. Limassol Municipality. Old Limassol Hospital. Central Bus Station. Central Police Station. Central Post Office.